What were Jens and James Eberhart experiencing on Christmas Day 1864 in Salisbury Prison 1150 years ago? It is not known what sort of celebration that James is yearning for. the etching on the left shows a wealthy family around the Christmas tree. We can only imagine that Jens yearned for the traditions of his home– the Norwegian celebration light, meat, beer and a Christmas tree. So this is my Christmas “card” to all of my blog followers–Have a very Happy Holiday. Do one thing today that reflects back on the traditions of your ancestors and remember that some individuals sacrificed everything so we could have the comfort of our families around us at this magical time. Florence C. McLaughlin, editor, “Diary of Salisbury Prison by James Eberhart,” The Western Pennsylvania Historical Magazine, July 1973. 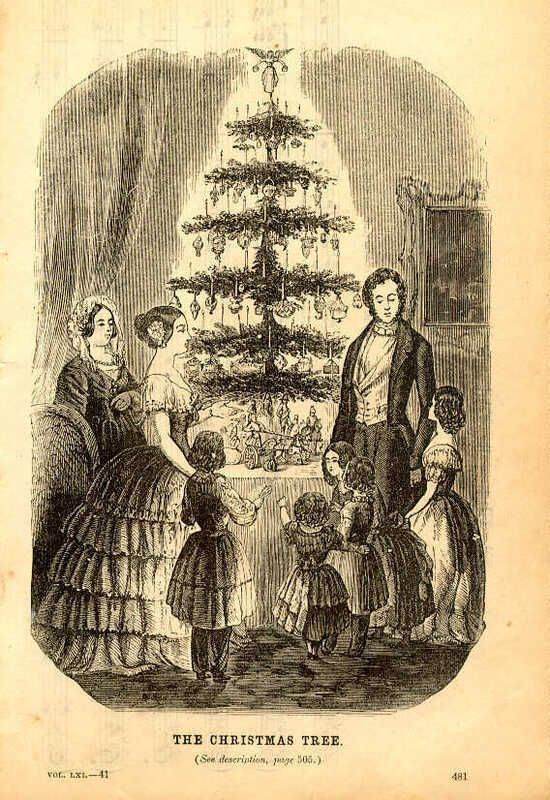 “The Christmas Tree,” Godey’s Lady’s Book, 1850 and republished in 1860.